I have been thinking a lot about purpose lately. It is not only the discussion around the new book Drive (which is already on my shelf, next in line to be read) and the three concepts in it: Autonomy, Mastery and Purpose. It is because I have started to realize that a big part of a manager’s job is to instill purpose. There are no insignificant roles, just people who make the roles insignificant and it is a manager’s role to make employee realize that. Imagine this. Starting tomorrow, there will be no people cleaning our streets. Ever. Garbage, foliage, random stuff that land in the street, will stay there forever. No one will take the garbage out of the streets. Would you like to live in such a reality? What kind of world would that be? Not a very nice one. What’s my point? 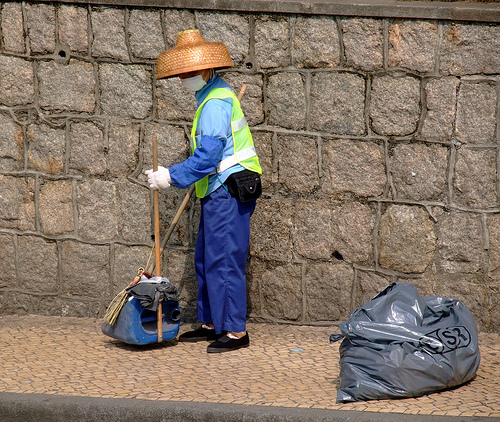 If you are that person cleaning the street – a job that many people will consider insignificant, what do you say to yourself? Do you wake up every morning and say – “hey, I am only a guy who cleans the street. This is a crappy job”. OR. Do you say to yourself – “hey, I am the guy who cleans the streets. Without me, society will crumble. I am doing something for the greater good. I make a difference”. You know what? This mentality is hard to keep. That is where managers should come in. This is where they need to instill purpose. To remind that worker, that his work matters. That he is not just a cog. That he is part of something bigger. That he makes a difference. That in every job you can make Art. And I know what you are going to say – “So, you want us to lie to our employees? To tell them they are important when they are not?” Well, no. because if you believe that they are not important, then you would not be able to instill the purpose. I am talking about genuine respect for people and what they do. Genuine understanding that every work could be done masterfully and could have a real impact on our lives (and I invite you to watch Barry Schwartz’s talk at TED where he describes how great janitors describe their roles). If you succeed in instilling that sense of purpose in your employees you are half-way on your way to noticing and recognizing them. You are on the right way to explaining, everyday, how they made a difference. And that is a good path to be on. Do your employees see themselves as cogs or do instill them a sense of purpose? I like that post. A good “glass half full” perspective for people who have negative outlooks on their job/career roles. It is an important manager role to help their employees feel that same importance that they should. Always happy to hear your thoughts. To me, that is the best job description of manager I’ve seen in quite some time. Some would argue that a manger’s job is to ensure that the work gets done. But if the manager can do as you describe above, then the work not only gets done, it gets done very well. And that’s what we so strongly promote: giving the employee a greater sense of purpose. Every worker, I don’t care what the job, needs to know how their work fits into the bigger picture — how what they do matters and contributes to the success of the organization. One of the best and most positive ways to do that is through recognition — telling the employee very clearly: “Thank you for your work doing X. The way in which you did will help us achieve Y much more quickly, and that matters to us because of Z.” How powerful. A manager who can do that is priceless. Thank you Derek… I really appreciate your comments… when you feel so strongly about something, it comes out in the writing. And if I make a point clear for someone, even if it something he knew but just saw it articulated in a different way that makes me really happy. I don’t think there is anything to add after your comment. Your comment made my day! Thank you!